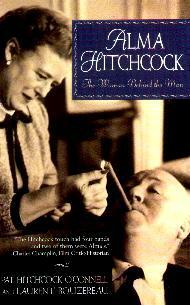 A tribute to the "woman behind the man", who in this case, is Alma Hitchcock, wife of the famed British film director, Alfred Hitchcock. Lovingly written by their only child, Pat, she includes how well her parents worked together, how her father respected his wife's creative contribution to his films, and importantly, she gives us a chance to know just one of the women who played such an important role in so many famous men's lives. The unsung heroes. The book is co-authored by Laurent Bouzereau who made documentaries on Alfred Hitchcock. This book is primarily about Alma but includes all aspects of her life, her family, their travels, her love of cooking, many family photographs, and even some of her recipes. Daughter Pat tells of their personal lives in England and later in America, much about the cast and creative people in her father's films, and it's a rare insight into the personal lives of such a famous and rather mysterious couple. Their love for each other was strong and their belief in one another astounding. I particularly enjoyed the details about her father and mother's preparation for each film and their loving collaboration, both on the set and at home. Their love and dependence on each other was extremely touching and their lives, by all accounts, was pretty simple. I'm now tempted to try and scour the video stores to see if I can find some of the Hitchcock classics. Conclusion - A must-have, must-read book for any serious Hitchcock fan. A great family story.